Today, you're 'meeting' one of my favorite bloggers, Kristine from Breakfast with Bentley. She's from Long Island, New York. She's a former English teacher, current law firm marketing associate and blogger. She's about to celebrate her 2-year anniversary in May and together they have two dogs (Bentley and Lambo)! If you wanna see more of Kristine, visit her Twitter and Facebook! Thanks again for guest-posting Kristine, loved having you! Without further ado. The whole idea behind my blog, Breakfast with Bentley, is to capture and treasure those special moments in life, whether it be the quiet time in the morning or a great recipe you perfected, a gift idea for a friend, or even advice to a future bride. Blogging is my way of sharing experiences, memories and ideas with my friends, family and the world. You can find posts on a variety of topics such as DIY projects, cooking, life and family, dogs, entertaining ideas, wedding planning tips and much more! I am so excited to be a guest blogger on The Everyday Grace! Kristen is getting ready to walk down the aisle and I'm getting ready to share a great DIY project with y'all! I know who is going to have more fun, but we can pretend, can't we? :) And don't forget to stop on by and say hello! My blog, Breakfast with Bentley, has some great blog posts on DIY projects, cooking, life and family, dogs, entertaining ideas, wedding planning tips and much more! Mary Bailey: Bread so that this house may never know hunger. Salt so that life may always have flavor.George Bailey: Wine that joy and prosperity may reign forever.I found other variations of this house blessing online and decided to add three more to the poem:Candle - may you always have light through the darkest times.Honey - may you always enjoy the sweetness of life. At this point, I knew I was going to create a different type of housewarming "basket". Instead of the traditional wooden basket, I found a colander at Home Goods and used that instead. I found a bag of rosemary pita chips (the bread), a candle, and dish towels at Home Goods too. I purchased the honey, salt and wine at a local food store. 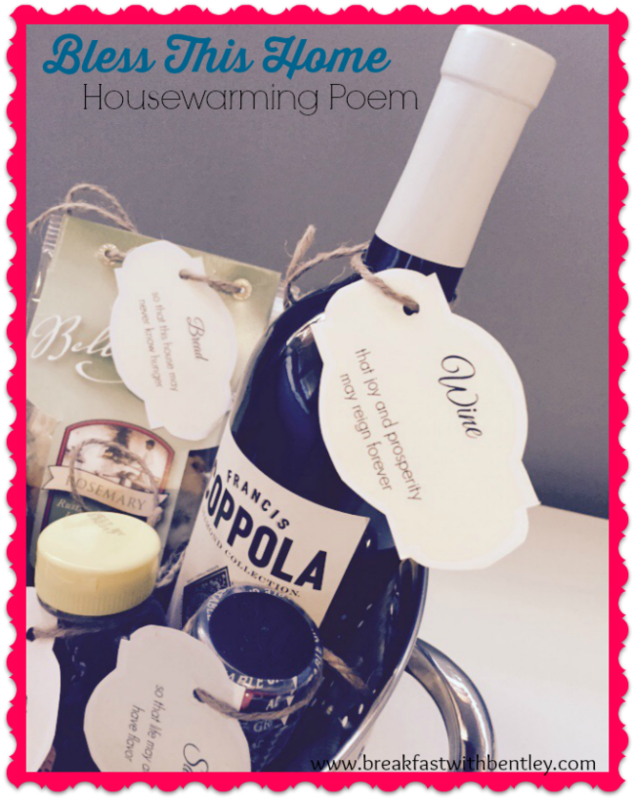 I placed the dish towels at the bottom of the colander, created these pretty Bless This Home poem tags, and printed out the tags. I cut them, punched a hole in the top and used twine to wrap each of them around the object.I placed each item carefully into the colander and took a step back. I was impressed! What a great looking basket! It is going to be a fantastic gift to someone who just bought a new home. Who wouldn't want to be welcomed with a blessing, wine and some bread? 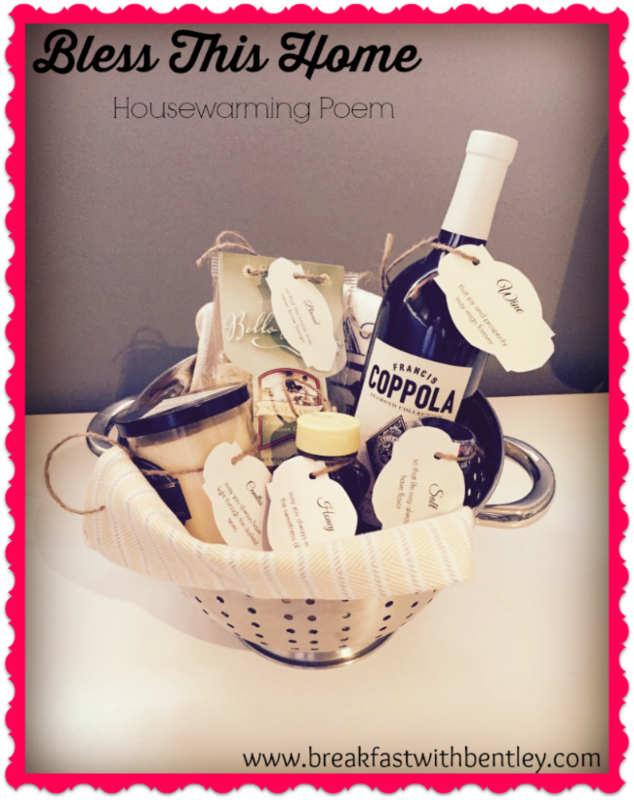 What would you include in a housewarming basket? Thanks again, Kristen, for allowing me the chance to takeover your blog for the day :) I hope you are enjoying every minute of your wedding / honeymoon! Don't forget to stop by my blog, Breakfast with Bentley, for great blog posts on DIY projects, cooking, life and family, dogs, entertaining ideas, wedding planning tips and much more!